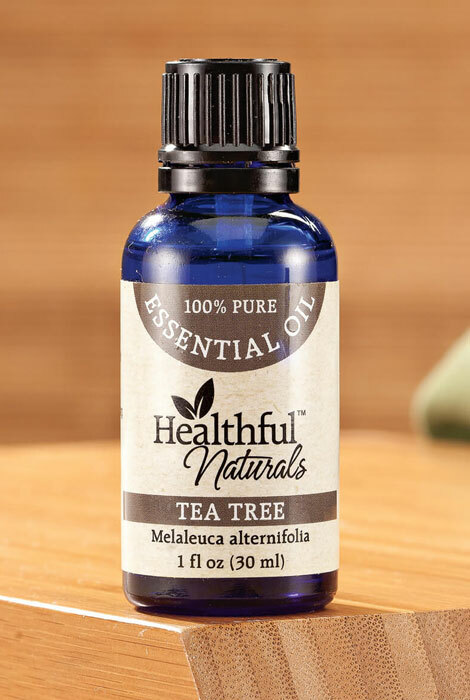 Boasting antibacterial, antifungal and antiviral properties, Healthful™ Naturals tea tree oil lives up to its reputation as a natural “cure-all”. Extracted through steam distillation of twigs and leaves of Australia’s Tea Tree, this pure essential oil boasts a variety of health benefits, as well as cleansing, purifying and uplifting properties. Its top note aroma is distinctly medicinal and camphoracous, blending well with lavender, clove and eucalyptus. When applied topically (diluted in a carrier oil before applying to skin), tea tree oil may help offer antiseptic protection for wounds, inhibit fungal growth and soothe skin irritations. Used in aromatherapy (diluted in water in a diffuser), tea tree essential oil may help support immune system. It is not intended for internal use. Complete with orifice reducer cap for slow drop delivery, the generous 30ml (1 oz.) bottle includes approximately 500 drops ... making our 100% pure essential oil an outstanding value. For topical use, dilute in a carrier oil such as jojoba, coconut or olive oil first.